The last two weeks in Ukraine have been dramatic and well covered in the world media. It isn't often to see a capital city torn up, dozens killed, the pro-Russian President ultimately leaving for a more friendly and secure headquarters in the country's east, and a stunning reversal where a former Prime Minister is suddenly released from prison with Parliamentary approval after languishing on trumped-up charges for nearly two and one-half years. With the drama paralleling the two week run of the Olympics in Sochi, Russia in terms of media coverage and world interest, Teatree assumes that the Ukranian developments represent just the latest chapter in a long running history of tension, with a return to some sense of normalcy still to be seen. As Canada's National Post reported Saturday, "KYIV, Ukraine — Hours after her release from prison, former Ukrainian prime minister and opposition icon Yulia Tymoshenko appeared before an ecstatic throng at the protester encampment in Ukraine’s capital Saturday, praising the demonstrators killed in violence this week and urging the protesters to keep occupying the square. Her speech to the crowd of about 50,000, made from a wheelchair because of the severe back problems she suffered in 2 1/2 years of imprisonment, was the latest stunning development in the fast-moving Ukrainian political crisis. Only a day earlier, her arch-rival, President Viktor Yanukovych, signed an agreement with protest leaders that cut his powers and called for early elections. Parliament, once controlled by Yanukovych supporters, quickly thereafter voted to decriminalize the abuse-of-office charge for which Tymoshenko was convicted. Yanukovych meanwhile appeared to be losing power by the hour. He decamped from Kyiv to Kharkiv, a city in his support base in eastern Ukraine, while protesters took control of the presidential administration building and thousands of curious and contemptuous Ukrainians roamed the suddenly open grounds of the lavish compound outside Kyiv where he was believed to live. Finally, on Sunday, the Ukraine Parliament (invalid according to President Yanukovych) also stripped Yanukovych of his position, and appointed an interim president until elections could be held - possibly by May. The new leadership promptly indicated their preference to orient the country towards the EU, with neighborly relations with Russia, and a new government will likely be installed in the next few days. Photo and caption from NBC news, "Newly elected Speaker of Parliament Oleksandr Turchynov speaks during a session of the Ukrainian Parliament in Kiev, Ukraine, 23 February 2014. Ukraine's parliament voted to appoint its speaker Oleksandr Turchynov as interim president and he will temporarily take over the duties of Viktor Yanukovych, whose whereabouts remained unknown." Since the Soviet breakup in 1991, the politics in the Ukraine have coalesced around a sizable pro-Russian segment and the majority wishing to orient towards Western Europe. In 2004, after more than a decade of decline and uncertainty, an Orange Revolution briefly brought to power western leaning leadership, including Yulia Tymoshenko, but in 2010, after further stagnation and unsure leadership, Viktor Yanukovych won a disputed election and quickly created an oppressive state leaning towards Russia, then engineered charges and a trial that placed his major rival Tymoshenko in prison. As a BBC article describes those years, crucial economic decisions were made regarding the country's dependence on Russian natural gas as well as Russian military presence at its bases on the Crimean peninsula. These agreements set the seeds for further tensions. 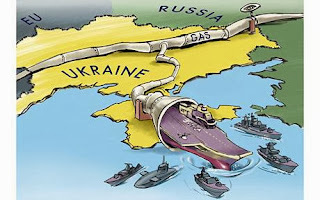 "In 2006, Ukraine was forced to agree to pay almost twice the former price for Russian gas after Russia briefly to cut supplies in a move that sparked alarm in western Europe as well. In January 2009, Russia again cut gas supplies in a row over unpaid fees." A visual from a UK Telegraph article noted that one of the first items Yanukovych negotiated in 2010 on his ascendance to power was an agreement to allow Russia continued use (to the year 2042) of its Crimean Peninsula navy bases. In the graphic, the pipeline symbolizes the Ukrainian need for Russian natural gas, and Russia's linked interest in secure naval bases. The Crimean peninsula itself has a particularly complicated history - belonging to several entities over the years, and even unique within Ukraine as an autonomous oblast (equivalent to more familiar province, state, or prefectures). The Soviet Union could be compared to other former empires that have broken up. Once broken, there are legacy regions still in play for decades to come - in the past we've discussed Kaliningrad, an exclave of Russians south of the three Baltic nations. In addition to the turmoil in Ukraine on Russia's southern border, there are two other recent hotspots. One happens to be just a few miles to the southeast from now-famous Sochi Russia, in the small country of Georgia. Here, the northwestern most province called Azbhakia has moved towards association with Russia. Further to the east, still in Georgia, is South Ossetia, also now in the Russian sphere of influence. In the latter case, Russian military might was a determining factor in a short conflict in 2008 resulting in South Ossetia's current status as in partnership with Russia. The Black Sea - Yalta, where Stalin, Churchill, Roosevelt framed the ending scenarios and agreements for a post WWII Europe; Sevastapol Ukraine, site of major Russian naval base; Sochi, Russia, winter Olympics, 2014; Azbhakia, Georgia, supported by Russia as in its sphere; Ukraine, split down the middle, and even Moldova's eastern slice on the other side of a river - Trans-Dniester, treats itself as independent and pro Russian. It occurs to Teatree that Ukraine as just one example of ethnic/historic tensions where disparate forces work to pull apart a modern nation. And, in point of fact, there are also many examples of small regions around the world isolated from former association with past empires. Much of Africa is the most common example, where dozens of countries still struggle with ethnic tensions - the legacy of arbitrarily imposed borders by European colonizers 130 years ago. Ukraine is one of several remaining trouble spots of the recent Soviet Empire. Another striking example is the Falkland Islands just off the coast of Argentina. Argentina declared sovereignty over those islands in 1982, the islanders objected, and the UK said no as well, resulting in a short war between the two countries. To this day, the population of just a little over 2000 remains a part of the United Kingdom at their own preference, much to the chagrin of Argentina, and possibly a headache for the UK.